My appreciation of Chinese furniture and the West's fascination with it continues with an investigation into an 18th-century bed - pictured above. This is, essentially, a dais or low platform. It's made like a table but with larger-section timbers. The legs end with in-curving hoof feet enclosing a soft-mat sleeping platform. Above the dais, four posts, a lattice screen - the making of screens as dividers for rooms was a very important sub-craft within Chinese carpentry - and a canopy above are added. The carvings on the canopy frieze depict interlocking dragons and stylised medallions formed from the character for longevity. The piece is tiger maple, and the overall dimensions are 2290mm x 2030mm x 1395mm (90in x 80in x 55in). As in the West, curtains were hung inside the bed to protect the sleeper from draughts and insects. This four-poster bed is more likely to have been a man's bed; the six-poster was a wedding bed and was often a dowry item brought into the marriage; this was more likely to be found in the women's quarters. There is an association between those who could write, the 'Literati' and those who made tables for them to write on. The Emperor Tianqi (1605-1627) enjoyed woodworking, and guilds regulated the activity of carpenters. There was a difference between 'large carpentry', which included beams and roofs, and 'small carpentry', which covered doors, windows, screens between rooms and the furniture used in the rooms. Apprentices worked with relatives or friends, and were expected to start with menial tasks before slowly working up to greater skill levels. The apprentice was expected to do everything from his own observations, and, in some cases, the asking of questions was not allowed. If you could not see how to perform the task you would not acquire the knowledge. The guilds also organised the annual celebrations to honour their guardian deities. In the case of the carpenters this was Lu Ban - see bibliography below. Another example of the organisation of the craft is to be found in a Sung dynasty (960-1279) manuscript which deals with the sawyer. Rates of pay are indicated for plank sawyers - the cutting of oak attracted the highest and fir the lowest. An adjustment was made for re-sawing single lengths of old, re-used material which was 'full of nails'. There are also figures for the various tasks within a workshop. A common ratio is four rough carvers, four finish carvers, three joiners and one finisher, all within the same workshop. Another fact recorded is the use of oil, lacquer and ash to finish furniture. In fact, Chinese written records contain so much historical, but perhaps apocryphal, detail about the craft that their writing, just like their furniture, puts us to shame. Suggestions of further titles to read are given to the right (See 'Bibliography' box out) for those who want to undertake further research. This pair of huanghuali chairs (see Picture 5 above) dates from the 18th century. The chairs are known as 'official's hat' chairs because the silhouette of their high rectangular backs resembles the hats worn by mandarins. They are 1120mm (44in) high. 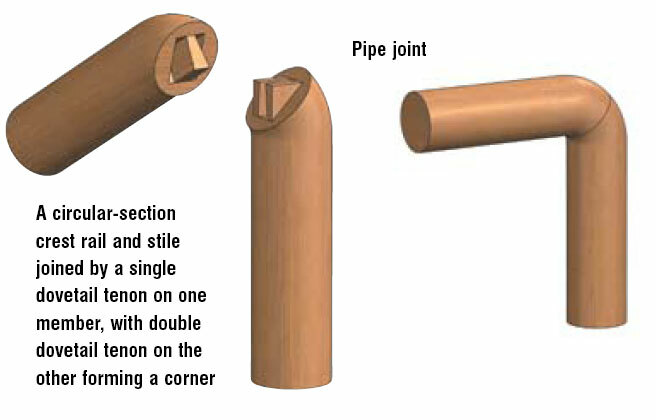 Notice the elegant 'pipe-joints' which join the arm and back elements - see drawing of joint opposite. This other pair of huanghuali chairs, above, was made a little earlier. 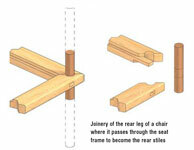 The crest rail resembles a yoke, explaining why they were known as 'yoke back' chairs. The splat is pierced with a 'Ruyi' or cloud scrolls shape, which contains a lion on one chair and a deer on the other. The serpentine arms pre-date the European equivalent - bear in mind these chairs were made at around the time of the English Civil War. We just had boring Puritan furniture then while the Chinese had serpentine and cabriole forms. "Apprentices ... were expected to start with menial tasks before slowly working up to greater skill levels"
This is a member of the Leguminoseae family, and is botanically classified as Dalbergia odorifera. It is closely related to rosewood. In ancient times the wood was known as huali or hualu. The prefix 'huang', which means yellowish-brown, was added in the early 20th century to describe old huali wood, the surface of which had mellowed to a yellowish tone due to a long exposure to light. This is a fine example of the antique trade altering traditional timber nomenclature. No European equivalent - the botanical name is Phoebe nanmu. Southern elm - Zelkova scheneideriana - was an important Ming cabinetwood. Not the same as our elm, which is Ulmus spp. 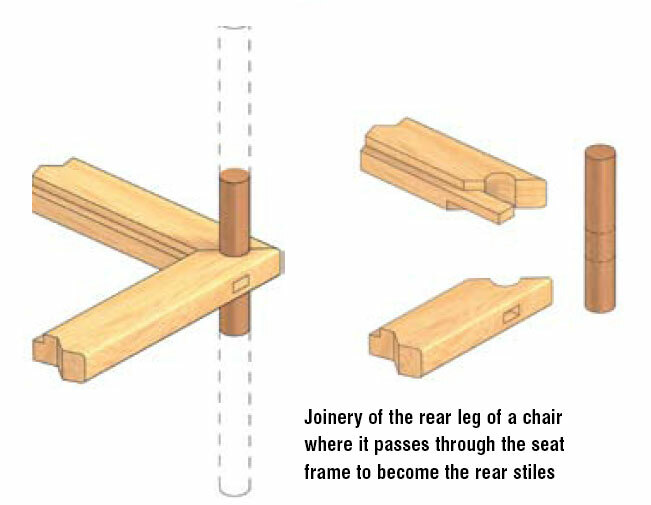 Some of these timber descriptions are taken from the web and should be treated with a little caution, but I suspect the basics are correct. The glossary in Connoisseurship of Chinese Furniture seems to provide the best cross-reference between Romanized Chinese common names and botanical Latin. There is great confusion in the naming of Chinese timbers and in the translations. Chinese makers were much more concerned with the appearance and workability of a timber than its actual name. Various journals of the Classical Chinese Furniture Society are all worth a look too. There is also a permanent exhibition of both ancient and contemporary Chinese furniture at the Victoria and Albert Museum in London. This book deals with the world of carpenters and joiners, discussing both the technical and the religious aspects of Chinese house-building. 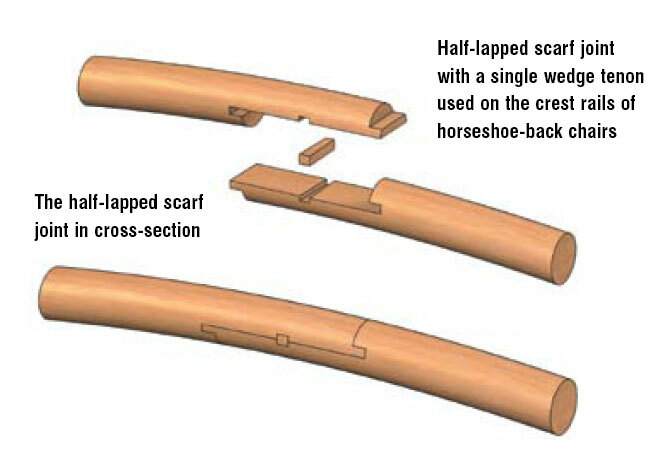 As furniture making was a part of the carpenter's job, sections on this craft are included. The recipes and proportions are ritualistic rather than actual, but a general sense of how the craft was organised can be felt. The book was written around 1600AD, and it's worth remembering that there is no equivalent of this book in the West.